This beef tenderloin with Madeira sauce is perfect for Christmas, or any special situation, thanks to the richly flavored, slightly boozy sauce and its failproof cooking method. Perfect for entertaining and impressing. 1. Using a sharp, thin-bladed knife, remove the chain muscle from the beef tenderloin. (The chain muscle is the long, thin muscle, connective tissue, and fat that runs almost the length of the beef tenderloin.) Reserve it for another use, such as stir-frying or ground beef. Then remove the silver skin and most of the surface fat from the tenderloin. 2. Next, about 5 to 6 inches from the narrow end of the beef tenderloin, make a shallow cut crosswise across the tenderloin, cutting about halfway through the meat. Fold this narrow end piece under so that the tenderloin is uniformly thick from one end to the other. Secure the tenderloin with kitchen string, tying it at 1 1/2-inch intervals along the length of the tenderloin. 4. In a large skillet over low heat, warm the remaining 2 tablespoons olive oil. Add the onions, stir to coat with the oil, and season to taste with salt and pepper. Cook for 2 to 3 minutes, then add 1/4 cup water, the thyme, and the balsamic vinegar. Cover and cook over low heat, stirring occasionally, until the onions are very soft but not browned, about 15 minutes. Uncover and, if any liquid remains in the pan, increase the heat to medium-high and cook just until the liquid evaporates. Again, do not let the onions color. 5. Preheat the oven to 425°F (220°C). Position a rack in the upper third of the oven. 6. Arrange the onions along the center of a shallow roasting pan just large enough to hold the tenderloin. (If you have a rather large roast, you can spread the onions on the diagonal to make space for it in the pan). Place the tenderloin on the onions.Roast the tenderloin until a thermometer inserted into the thickest part registers 125°F (52°C) for medium-rare, about 45 minutes. The roast will vary somewhat in doneness depending on the thickness of its sections. Remove the pan from the oven, transfer the meat to a platter, and tent with aluminum foil. Let rest for 10 to 15 minutes before slicing. 7. In a saucepan over medium-high heat, bring the 1/2 cup Madeira to a boil and cook until reduced to 1/4 cup. 8. Pour about 1/2 cup of the pan juices from the roasting pan through a fine-mesh sieve into the saucepan. Discard the thyme but reserve the onions in the roasting pan. Add the beef stock or broth to the saucepan, bring to a boil, and cook for 2 to 3 minutes to reduce slightly and blend the flavors. Reduce the heat to medium-low and stir in the demi-glace and red wine vinegar. Season to taste with salt and pepper and, if desired, 2 to 3 tablespoons more Madeira. 9. Meanwhile, place the butter and flour in a small bowl and mix together with a fork until well combined to make a beurre manié. [Editor’s Note: A beurre manié is a simple manner of thickening a sauce, lending it a rich, smooth, velvety consistency.] Reduce the heat under the sauce to low, whisk the beurre manié into the liquid a little at a time, and simmer until the sauce reaches the desired consistency, 2 to 3 minutes. Keep the sauce warm by covering it and placing it over very low heat. 10. Transfer the tenderloin to a carving board. Remove the strings and simply slice the roast into slices about 1/2 inch thick. Place a spoonful of the reserved onions onto individual plates and top with a slice of tenderloin. Spoon a little of the sauce over the meat and pass the remaining sauce at the table. Beef Tenderloin Recipe © 2009 Williams-Sonoma. 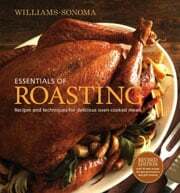 Photo © 2009 Weldon Owen Inc. | Williams-Sonoma. All rights reserved. All recipes and photos used with permission of the publisher. Impressive and delicious! This beef tenderloin with Madeira sauce is so perfect for Christmas, or any special occasion, because of the richly flavored, slightly boozy sauce. The instructions may seem lengthy, but don’t be discouraged. After prepping the onions and trimming and tying the tenderloin, the oven took care of almost everything else. My tenderloin weighed very close to 6 pounds before trimming, and it took closer to 1 hour to reach that medium-rare temperature. It was beautifully pink and rare on the inside. The sauce was delicious even though I omitted the red wine vinegar. I also added 3 more tablespoons of Madeira. I kept the sauce warm in a small saucepan on a low burner until serving. We felt the onions were just okay, but other than serving as a flavoring bed for the tenderloin and the sauce, they didn’t add much to the final dish. This Madeira sauce was simple yet delicious—silky and tasty but transparent enough to allow the flavor of the beef to shine through. It’s a keeper! I made the recipe using filets instead of a whole tenderloin. After cooking the steaks, I let them rest and kept them warm in foil, then sautéed a thinly sliced Vidalia onion in the pan to mimic the whole tenderloin recipe. I then added some of the beef stock to the pan to deglaze it, since I didn’t have drippings from a whole roast. I strained out the onion and reserved it for serving the fillets. I continued tasting and seasoning the sauce before adding the vinegar, settling for about 3/4 teaspoon of the red wine vinegar versus the 1 tablespoon the recipe called for. I found that amount to be perfect. I kept the sauce warm on a very low flame, but went back later and found that it reheated perfectly, which tells me you can make this ahead of time. If you choose keep the sauce warm for a long period of time, you can also put it over a pan of simmering water. The result was a dinner of perfection. This recipe is easy, delicious, and worth it! Making the onions was a snap, and actually kind of fun, but making the sauce could have gone better. I didn’t end up with a half-cup of pan drippings, so I used what I had and punted on the rest. The sauce was delicious as is, but next time I’ll make a bit more of the beurre manié and add it until the sauce coats a spoon and has a little more body. I used almost 3 tablespoons of demiglace and no red wine vinegar. I just turned the heat off, put a lid on, and the residual heat kept it just perfect. Set a great tenderloin on the table and it can steal the show. A good tenderloin is always sure to make mouths water. By the way, folks, make sure to check out Georgia’s Blog. She’s totally kickass. I decided to make this the centerpiece of my Christmas dinner in an effort to impress my boyfriend’s family. It didn’t disappoint. I followed the recipe without a hitch, doubling the sauce (and adding a touch more demi glace and Madeira) so we could eat it over potatoes. It was beautifully rustic, and a snap to make–you don’t even have to babysit the oven or stove so you can turn your attention elsewhere (like dessert!). Prep the meat the night before to save some time. I have tried this recipe twice. The second time I used a combination of sherry and Nassau Royal liqueur instead of Maderia. Two different tastes, both excellent. This is really an easy recipe and easier still if you get the butcher to remove the extra tissue for you. A good butcher will have no problem with that. Everyone loved it and it has become a keeper in our house for sure. It’s a wonderful recipe for a dinner party with friends and will impress far more than the effort expended to make it. Appreciate both the comment and the suggestion on the liqueur, Ken. We can hope for no higher praise than a recipe that’s made repeatedly and with raves! Sometimes meals are just magical. This was one of them. My fellow diners declared this meal one of the best I’ve ever made. I agreed!!! What I did: I followed the meat instructions pretty much as written. I started the onions first while the beef came to room temp and then prepped it as directed. I cooked the tenderloin on my green mountain grill at 425 degrees. I pulled it off exactly when it hit 125 degrees at the thickest part and let it rest tented for 10 mins. I was worried it might be too rare for our taste. It wasn’t. It was perfect – and was sooooo unctiously delicious and cut easier than butter!!!! I served it with a wonderful Pinot noir which just heightened its delectbility. The sauce story: The grocery store was out of Madeira. What to do? What to do? The wine steward recommended a dry sherry. When I tasted it at home I didn’t really like it so at the list minute I switched and fudged a Stilton-blue cheese sauce as an accompaniment. It was so good with the tenderloin and baked potatoes. So it wasn’t exactly this recipe, and I apologize for not reviewing the original, but after last years failed attempt at overcooking a whole tenderloin, this tenderloin will go down in history as absolutely amazing!!! Thank you, again!!! You guys are my go-to website for superb recipes. Thank you, thank you, thank you!!! And Merry Christmas. I hope this simple review will be a pleasing gift of sorts as well!!! You are so very welcome, Jeanne! And no apologies necessary for deviating from the recipe. That’s part of cooking (and life), yes? Making due with what happens. We’re so relieved to hear that you loved this and that we’re your go-to recipe site. Rest assured, we do test all recipes in our home kitchens prior to putting them on the site, and about half the recipes don’t actually make it on the site as they’re simply not spectacular enough. So if you find something on our site, rest assured, it’s pretty foolproof. Wishing you and yours all the magic of the season…!